Electrical appliances in their turn are not considered secondary accessories but are chosen from among guaranteed makes and fitted with care into the design to form a rational whole. Ease then is an appropriate term and signifies the pleasure of women who love to spend part of their time in such a domestic ambience. 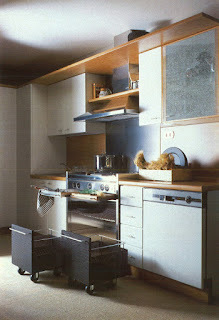 Every corner of the kitchen becomes a welcoming space, every furnishing article a useful and devote servant. Nothing is superfluous because nothing is left to chance but everything is the fruit of died design. Fatigue is relieved, spaces are multiplied, discreet light is indisputable champion. Table and chairs complete the ambience in either central standing solutions or extractable ones from the walls. This variation too has been thought of to meet the needs of different sized families. A wide series of tastes is thus satisfied and everyone will discover the pleasure of living comfortably in this warmly welcoming room.